Nathan Gray, 14, of Milford, left, and Benjamin Streeter, 15, of Bedford get robots ready for the timed trial on the Martian landscape playing field. Members of Mindstorms Mayhem know as much about programming the computer motors as they do about building the robots out of LEGOS. Above, miniature astronauts sit on a LEGO piece on the playing field. will represent state in international competition. In a room filled with young brains that could spout facts and figures on the geothermal activity on Mars, a bad case of the giggles broke out. First it was 15-year-old Benjamin Streeter of Bedford and then 10-year-old Melissa Gray of Milford. Soon enough the entire FIRST LEGO League team made up of middle school-aged homeschoolers from Bedford, Wilton, Merrimack, Milford and Hollis was cracking up. 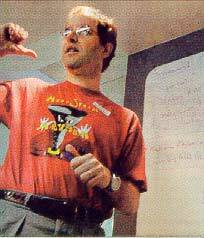 Infectious giggles are a hazard of the job, according to Ken Streeter, coach of the Mindstorms Mayhem team. Contagious as well are the smarts that each team member exhibits during the presentation that could win them international acclaim during the FIRST LEGO League International Invitational in Atlanta next month. FIRST LEGO is the middle school answer to the high-school level FIRST Robotics Competition Championship, where life-sized robots compete in an arena to complete tasks such as putting balls in a basket and negotiating uneven terrain. It's the baby of Dean Kamen, New Hampshire's well-known inventor of the Segway Human Transporter. The LEGO version lets the seventh- and eighth- graders put their problem-solving and scientific skills to work. 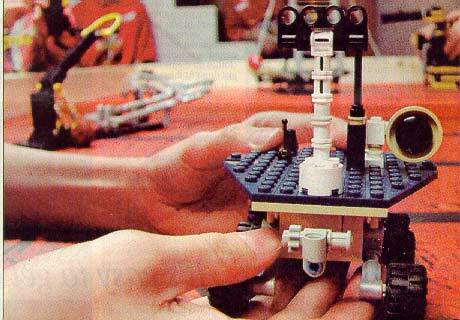 FIRST LEGO robots are designed by the individual teams and consist of a battery / motor and LEGO pieces, nothing else. Several robots are used to perform different tasks on the Martian landscape playing field. The Mindstorms Mayhem group -- sponsored by BAE Systems -- competed against 47 other teams around the state in December and won the coveted "Director's Award" for best overall presentation. Now they'll head south to do battle against teams from 40 other states and six other nations. Here in the spacious and well-lit finished Milford cellar of Mayhem coach Bill Gray, about a dozen Mindstormers run around working on laptop computers, adjusting LEGO contraptions and practicing lines from a skit. In their red T-shirt uniforms, they look like a small army of red ants swarming to get a job done. It's a Monday morning. The team usually meets on Friday mornings to do their work; the looser schedule of homeschooling students allows for that. LEGO parts -- thousands of them -- lay about. Laptop computers are open and running. Students split their time between computer work and tinkering with the robots. The competition this year sends the students to Mars. Not really, of course, but they'll visit problems and situations encountered by NASA engineers and scientists who worked on the Mars Rover missions. The LEGO robots are made of the small, connectable plastic parts and computer-driven electronic motors that look like a battery the size of a wallet. 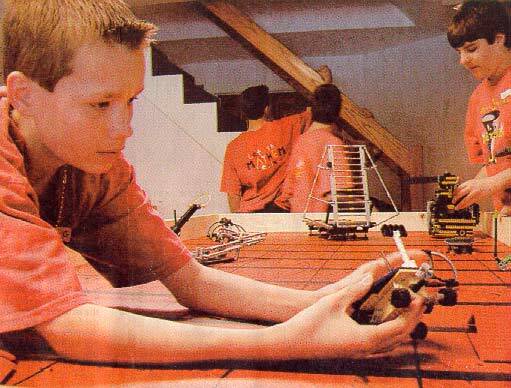 Computers allow the students to program the robot to move a certain distance and perform tasks on a billiard-sized playing table. What the robots do on the table is directly related to a skit the students put on before the robot work starts. The young ones perform their act, discussing geothermal layers on Mars, subterranean drilling and ice cores. All the while, Streeter follows along a script and mouths the words like a film director. He asks 11-year-old Nathan Streeter of Bedford to speak up during his presentation. David Schunemann, an 11-year-old from Hollis, needs to slow down when he talks, he says. 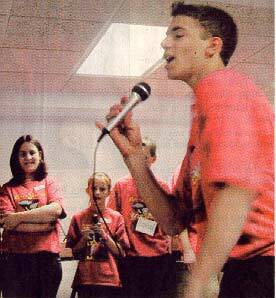 Benjamin Krupkin, 15, of Milford cuts a rap about the Martian landscape as Victoria Umenhofer, 13, of Wilton, and Melissa Gray, 10, of Milford look on. The skit starts with Daniel Umenhofer, 10, of Wilton working a television remote made of LEGO blocks. The channels he clicks to include the other members of the group performing commercials, speaking on news shows and even one who raps. All include information about the Martian landscape and how to create energy using the robots. Afterwards, Gray and Streeter, acting as show judges, drill the students on the practicality of finding and using energy on Mars. Most answers are correct and to the point. Some information, the students report, came from actual e-mails to NASA scientists. Then it's off to the table which is covered by a paper Martian landscape. Grid lines define distances. LEGO structures like ice cores, habitation modules, and solar panels sit on the field. The robots start from a corner and wheel their way to spear the ice cores, wipe dust off the solar panels and connect habitation modules. It's hard to figure out what's more intense, watching the robots work or the students who need to pick up each one after a mission, lay down another, program it, and let it go. The robots are fit with devices -- all made of LEGOs -- to help them complete their tasks. An attachment wipes LEGO blocks off the solar panel; another pokes through the ice cores and then dumps them off. The competition is judged in five areas: research and presentation; robot performance; technical mechanics of the robot's construction; teamwork; and what judges call "FIRST values" or gracious professionalism. And whether or not the students win the competition, they're having a blast. Even when they're blowing lines during the skit or when robots have a burp in their programming, smiles abound. Mindstorms Mayhem coach Ken Streeter of Bedford goes over the day's tasks before a practice session in Milford. He and Milford coach Bill Gray act as technical support and skit directors and keep the meetings rolling. "These kids really learn how to figure out problems," Streeter said. "And they have to build these things, change them when problems come about." For homeschoolers, the opportunity to work alongside other students is a huge plus, Gray said. "They excite each other about this," Gray said. "It's an opportunity for them to be involved in team-oriented activities." The only down side to the competition is the cost. Gray and Streeter say they had to figure out how to come up with the about $10,000 it will cost to get the students, some parents and the coaches to Atlanta and back. BAE Systems is putting up half. The contest runs April 15-17. The Mindstorms Mayhem team representing New Hampshire is: Melissa Gray, 10, Milford; Nathan Gray, 14, Milford; Brian Jennings, 14, Merrimack; Benjamin Krupkin, 15, Milford; Jacob Krupkin, 12, Milford; David Schunemann, 11, Hollis; Benjamin Streeter, 15, Bedford; Nathan Streeter, 11, Bedford; Daniel Umenhofer, 10, Wilton; Victoria Umenhofer, 13, Wilton; mentor Christopher Jennings, 16, Merrimack. The coaches are Bill Gray of Milford and Ken Streeter of Bedford.